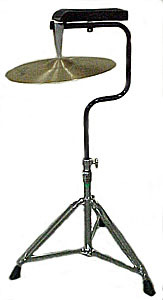 A cymbal (circular brass plate measuring from 16 to 22 inches across) that is suspended on a stand and is struck with drumsticks, brushes, or more often, mallets. The suspened cymbal is typically used in a symphony orchestra, symphonic band, concert band, brass band, and other large instrumental ensembles to provide a musical effect that creates tension in a composition. The suspened cymbal can also be used to keep a rhythmic pulse of the composition or provide percussive accents in a composition.